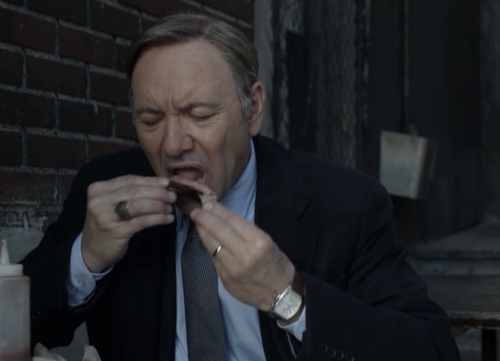 If you've been watching Netflix’s House of Cards series, you’ll be quite familiar with how much the main character Frank Underwood loves his BBQ ribs. So let’s say you wanted to get the same ribs that Frank gets, what type of BBQ ribs would you eat? Frank has his choice of 3 different types of ribs from the pig - Upper spare, Lower Spare, and Baby Backs. Upper Spare – Frank would choose this one if he valued fat and meat thickness the most. The upper spare ribs are the ones closest to the neck and are meatier and fatter. Lower Spares – If tenderness yet full flavor is what Frank prefers he’d the lower portion of the spareribs which have less meat and fat but since it’s thinner will cook up much more tender. Freddy the BBQ guy often opens early to serve Frank a breakfast plate of ribs in the morning. BBQ takes a long time to do, so unless the Pitmaster wants to wake up at 3 in the morning, it’s not likely that he’s cooking him spares. Babybacks have a quick turnaround, most places will cook up babyback ribs in 3 hours. One famous joint Tennessee fires them out in just over an hour. Given that Frank likes his ribs at odd hours through the day, it’s likely babybacks are logistically more possible. In Chapter 6 Freddy gets a last minute party catering request. Again, unlikely that he was going to fill that order without using baby backs. Freddy’s is dive. Like a real dumpy dive. Unless you’re a connoisseur, most people have trouble understanding the price premiums that Baby backs command. Freddy’s a South Carolina boy and all the top rib guys there – Sweatman’s, Maurice’s etc use spares not babybacks. Spares have more flavor and since he refers to his rib habit as a vice, it might lean more towards the fatty belly meat on the spares vs the lean loin meat of the babys. Why Frank might prefer baby backs. First off Frank eats a lot of ribs. A lot. Most people who like to eat a lot of ribs will tend to go for the baby backs as they’re less fatty. Frank eats them before going to work. As baby backs are relatively more uniform than spares, they’re less messy to eat. Thought nothing says political power like BBQ sauce on your tie. Baby backs are easier to eat. Frank looks like the type of guy to streamline everything. It’s hard to imagine that on his off hour, he’d want to deal with inconsistent bone structure of spares when he can have a nice neat row of ribs from the baby backs. It’s likely that Frank prefers a more tangy sauce with a bit of spice. This would be consistent with his Carolina heritage and the fact that he likes to eat a lot of ribs. BBQ sauces are sweet for a reason, because people don’t eat that much BBQ so the acute sweetness is very pleasant for the occasional smokey binge. But for people who eat BBQ all the time, the tart sauces cuts through the fattniess of the meat and enhances the smokey pork flavors.